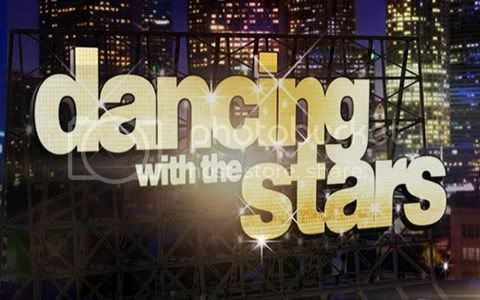 Quick Take: Dancing With the Stars 14, "Week 8"
Six couples plus six pros equals the trio dance. Review: Dancing With the Stars 14, "Week 8"
(S1415) Leading up to Tuesday night's first ever double-elimination, the six remaining couples had two opportunities to win the votes of the judges and viewers. First up was their individual dance and following that was the first ever Trio Dance, where the couples asked an eliminated professional dancer or a member of the dance troupe to dance with them. Dancing last but coming in first was William and Cheryl, who ended the night with a score of fifty-seven out of a possible sixty for their individual foxtrot and paso doble trio dance. Their foxtrot was high-energy and fun to watch and earned them a perfect score of thirty. Len said it best; the performance had care and flare. For their paso doble Tony Dovolani joined them for a performance that was strong but unfortunately lost sync at certain points. That didn't seem to bother the judges much as they earned triple nine's for the performance. After two weeks of being in the bottom two, Roshon had his best night of the competition following his individual foxtrot with Chelsie and his paso doble with Chelsie and troupe dancer Sasha scoring a fifty-six. Roshon and Chelsie's foxtrot was a joy to watch and garnered them a twenty-nine - their highest score of the competition. Len said they looked like two little dancing munchkins. Their paso doble didn't disappoint either. While Roshon did lose sync with Sasha at some points it was still a good routine. Leave it to Len to have the best analogy, he said that Roshon and Sasha were like two skinny fries chasing the ketchup (Chelsie). Hopefully these two great performances and high praise from the judges will save Roshon from elimination. The elusive perfect thirty is still slipping through Donald's hands, but, he should be very happy with his two dances on Monday night. Kicking off the evening he and Peta danced a tango that set the bar high for the evening according to Len. Carrie Ann said it best, it was incredible to watch. The judges scored them a twenty-seven. Their jive with Karina Smirnoff was the best trio dance of the night. It was high energy, fun and completely in sync. Donald did earn one ten from Carrie Ann while Len and Bruno both scored them with a nine. Donald and Peta ended the night with a fifty-five. Also earning a combined score of fifty-five were Katherine and Mark who were joined by Tristan MacManus for their trio dance. For their individual dance Katherine and Mark danced the Viennese waltz that was enjoyable to watch. Len was pleased that it was full of content and had plenty of hold time. Meanwhile all Carrie Ann could focus on was Katherine's loss of balance at one point in the dance - seriously - and scored them with an eight - their first eight in four weeks. Overall their waltz earned them a twenty-six. For their trio dance they performed the cha cha. At one point Katherine had a bit of a wardrobe malfunction but she powered through and didn't miss a step. Carrie Ann said that the fire that she was lacking in her first performance came through in this one. They earned a twenty-nine for their trio dance after receiving ten's from Carrie Ann and Bruno and a nine from Len. After earning a perfect thirty last week Maria and Derek had trouble maintaining that high only garnering a twenty-eight for their individual dance and a twenty-five for their trio dance with troupe dancer Henry. Their Viennese waltz was nice but I wasn't wowed by it. While Carrie Ann and Bruno loved it, giving them each a ten, all Len could focus on was that there wasn't enough dancing in hold and scored them with an eight. Their trio samba wasn't all that great in my opinion. They did a Bollywood inspired samba that was seriously lacking samba. Once again Len was the harshest critic scoring them a mere seven while Carrie Ann and Bruno each scored them with a nine. They ended the night in fifth place with a fifty-three. Landing at the bottom of the leaderboard were Melissa and Maks, who joined by Maks' brother Val for their trio samba earned a fifty-one for the night. Up first was their individual performance, the foxtrot, in which they earned a twenty-four for what the judges dubbed her best dance ever. The performance wasn't bad, but, I just find her leg movement to be weird at times and it also seems as though Maks is pulling her to keep up with him. The complements and high scores continued for their trio performance. They earned a twenty-seven, an all-time high for them and it must have been Melissa's night because the judges declared the trio dance her best dance ever. The dance wasn't bad; I just didn't see much samba going on. Overall the concept of the trio dance wasn't bad. I actually like it more than some of the gimmicks they have done in the past, like the instant dance and last week's group dance. I love following Dancing with the Satrs and this article really helped me! !